One of the biggest challenges of riding a good half halt is getting the timing right. This is especially true if you are riding on your own and don’t have someone there to remind you to release immediately after the half halt. We all know that the release is every bit as important as every other part of the half halt, but sometimes when we’re alone and not getting the feeling, we can suddenly realize “OMG, I’m holding too much and not letting go.” Only by letting go do we allow the half halt to do its magic. If you are getting a heavy, leaning, or pulling feeling in your hand, ask yourself honestly, am I releasing quickly enough? A trick I use to help me to remember to release quickly, is to never think of a half-halt as a single entity (which I can get stuck in and hold too long) but rather always think of a series of half halts: small-medium-large. I call it ordering my half halts at McDonald’s. If you do a small-medium-large series of half halts, you remember to release right away because you need to, as another half halt is immediately pending. Over time, by ordering them small-medium-large, the horse begins to anticipate, OK that was small, I better get rebalanced because otherwise medium and large are coming. When you the rider feel that rebalancing, then you don’t need to continue with the whole series but can stop after small or medium. Now you are getting the immediate response you want to your quick light half halt which you have quickly released. The other trick I use on myself is to call them fractional halts instead of half halts. I ask myself, “Today, can I always do three fractional halts in the time in which I would normally do one half halt? Can I do four?” That would make them one-eighth halts, right? With fractional halts, once again I just can’t forget to release, and as a result I end up with very quick and light half halts where I am not holding and the horse is not leaning on me. If your horse is still learning the idea of the half halt, or you have a horse that wants to evade the work by getting quick and running through your half halts, don’t resort to holding longer to get a point across. That will only make him stronger and heavier over time. Instead, use the walls of the school to help you teach him what you want. For this exercise, in trot ride a small circle between 8 to 12 metres in diameter (depending on the level of training of the horse) at each letter on the long side. As you are approaching the wall or the fence of the school, apply your series of small-medium-large half halts or fractional halts to ask for a walk transition, and if necessary steer him with your seat and legs directly towards the wall. The wall will naturally cause him to slow down, transferring his weight back onto his hind end, and he will come back to walk without you holding or pulling. Praise him, trot on, and repeat at each letter. The wall of the school will assist in creating the reaction you want, your praise will motivate him, and your concurrently applied correct aids will teach him that this is how you will ask for it. As trainers we have to model for our horses how we want them to be. These techniques can help you to remember to be light, quick, and quick-to-release in your aids, so your horse can be likewise in his reactions. just as an aside, most of what I do is drive. And everything you have posted has helped me with driving–including working on the mystery of the half(small-medium-large) halt! This is a young mare that I bought as a halter broke 4 year old and basically did ground work – manners, walk on a loose lead, halt, stand, back etc. that whole first year. Last year I started her under saddle and in mid-June in harness. I am essentially (by necessity — both finances and access) self-taught in both disciplines–have been riding (trail — no shows) for almost 60 years (even I find that hard to believe!) and driving now for almost 20 — again, recreational, no shows ($$$ and access again!). However, my goal for this mare — beside our partnership — is to have a little horse that could compete successfully both under saddle and in harness. Your musings have been/are invaluable for both :~) Just wanted to say thanks again. 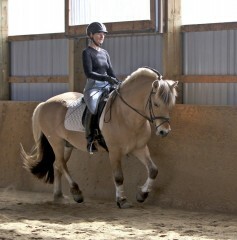 I still don’t know what a half halt is – a slowing down, transitioning from a trot to a walk ? I am relatively new to riding as I got back into it shortly before I turned 60. Can you give a definition of a half halt in simple terms. Glad you brought this up as I was going to go hunting for a definition. I am very glad to hear that Sue! I know what you mean about the driving — my driving ability got so much better after starting dressage riding lessons! 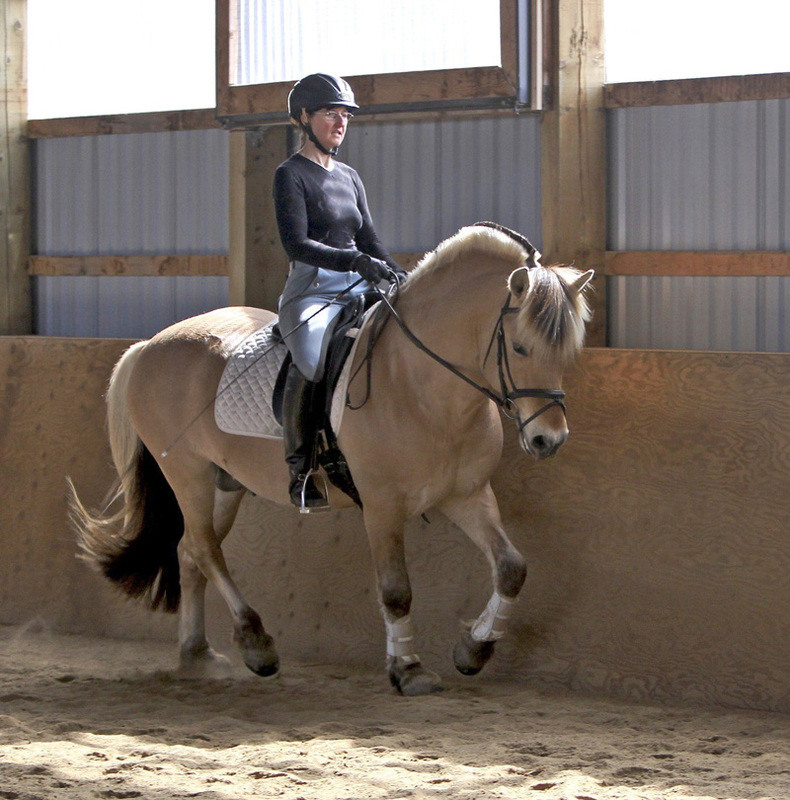 I never drove during the winter, then started dressage lessons one January and that spring when I hitched again everything went so much better, the horse was straighter and more connected. The skill set seems to transfer really well. When you are learning, you could think of it as “half a halt”. In other words, think, “I want to halt”, then half-way through change your mind and send him forward again. You should feel the horse take more weight on the haunches in preparation for halting, then move forward with more balance and energy when you change your mind and send him on again. Awww, yes, the mystical half halt! Thank you, another piece to the puzzle, very helpful! Helpful and clearly explained. BTW, your website is beautiful!